Pre-registration required; no fee; space is limited; registrants need not be registered for Winter Institute. Email Lisa Winn (lisa@bookweb.org) to register. 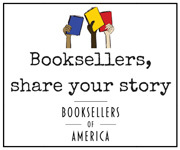 Discuss the art of selling used and rare books with fellow booksellers. Topics will include merchandising policies, inventory acquisition, events, displays, remainders, online sales, store layout, and more. Hear from veterans and newbies alike about the unique world of used books. Developed and presented by Shane Gottwals of Gottwals Books and the Walls of Books Franchise (Warner Robins, GA).